Unfortunately, many people are reluctant to smile because they’re not happy with the way their smile looks. And while many people are interested in improving the appearance of their smile, a lot of them aren’t ready to undergo a complete smile makeover. Veneers are thin layers or “shells” which are seamlessly applied to the front of your teeth. We only use porcelain veneers from Lumineer, which is the number one patient-request brand of veneers. Veneers are painless and they can be customized to blend in with the rest of your smile. Veneers from Lumineer are ultra-thin, about the width of contact lense. Placing your dental veneers is pretty simple. It requires a minimally invasive procedure that can typically be completed in one or two office visits. First, you meet with Dr. Grubb for a consultation. 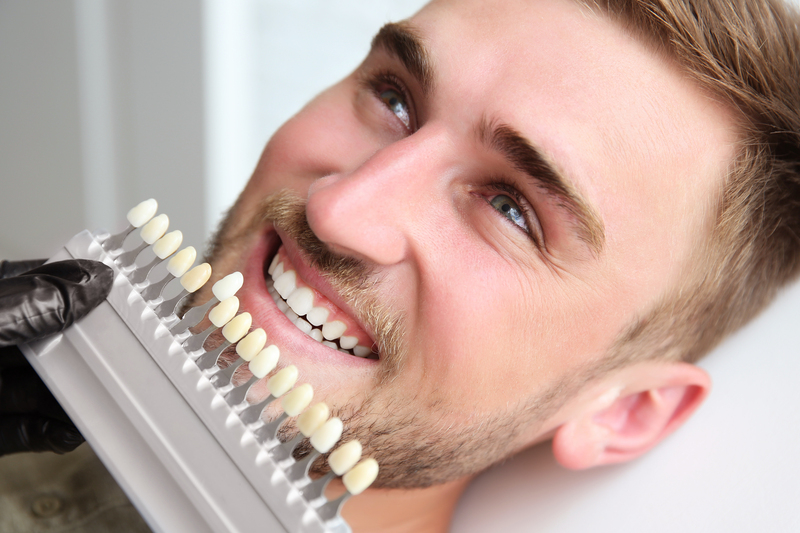 If Dr. Grubb determines that veneers are the ideal way to revitalize your smile, he will measure your smile and create a mold of your teeth to send to the laboratory. A few weeks later when your veneers are ready, you’ll return to our office. Then Dr. Grubb will remove a thin layer of enamel from your tooth to create space for the veneer. Dr. Grubb will temporarily place the veneers on your smile to make sure they fit the way you want them to. Once you decide that the veneers look right, Dr. Grubb will use cement the veneers to your teeth. We only use porcelain veneers from Lumineer because porcelain is strong and aesthetically pleasing. It’s also highly stain-resistant and you can brush porcelain veneers just like you do with the rest of your teeth. Most people can’t tell the difference between a porcelain veneer and your natural teeth because porcelain provides a translucent effect which simulates the way your natural teeth respond to light. If you are unhappy with your smile for any reason, call our office to arrange your consultation with Dr. Grubb. We’ll help you find the restoration that works best for your unique situation.